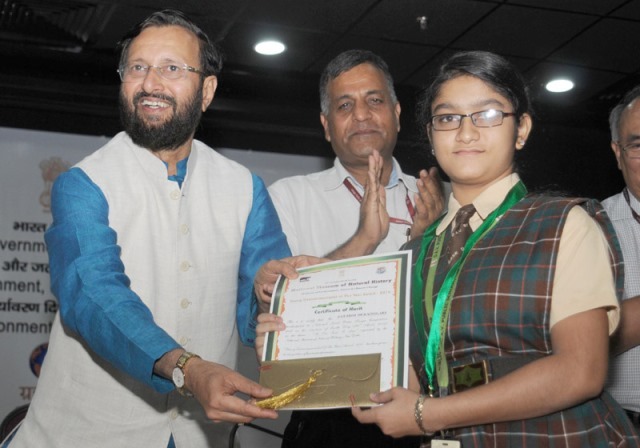 Environment Minister Shri Prakash Javadekar presenting the Young Environmentalist of the Year Award 2015 to Kum. Satabdi Debadulari, on the occasion of the World Environment Day, in New Delhi on June 05, 2015. Secretary, Environment, Forests and Climate Change, Shri Ashok Lavasa is also seen. Weekly environmental news roundup from across different media networks for week 23 (between June 1 to June 7) 2015. Believe it or not, the sewage-filled Yamuna is playing a major role in keeping Delhi’s temperatures under control. Only half of Delhi is connected to sewer lines, which means that the other half’s waste flows, untreated, into the Yamuna. The prevailing high temperatures have contributed to a spike in ozone levels to over double the permissible limits in some parts of the city in the last 10 days. Some call it “capital punishment” that kills slowly; others simply put it as air pollution — a lethal cocktail of toxic gases spewing from vehicle exhausts and factories mixed with dust and microscopic particles that sticks to human lung walls like industrial sludge. In a city where burning of a handful of dry leaves attracts a fine of Rs 5,000 to clean up the toxic air we breathe, thousands of trees are cut and the wood is given free of cost for burning. The sudden boom in diesel cars and trucks in Delhi and the National Capital Region (NCR) has escalated the level of ozone gas in the air. Delhi is now notorious as the most polluted city in the world but within the national capital too residents of Punjabi Bagh, RK Puram and Anand Vihar suffer more than other Delhiites. The Delhi government on Friday locked the doors of 27 hotels in the Mahipalpur area that were operating without permissions from civic agencies and the Delhi Pollution Control Committee (DPCC), while 50 more hotels face closure. The Yamuna, which travels through Delhi collecting garbage, sewage, construction waste, religious offerings and industrial effluents, may still have a chance to become pollution-free. The National Green Tribunal today issued notice to the Delhi Government and others on a plea seeking directions to restrain authorities from transferring a part of South Delhi’s Aastha Kunj Park for private use. In the single largest case of deforestation in the Capital’s history, a green swathe of woodland as big as a dozen adjoining football fields has been illegally flattened in northeast Delhi. A latest survey conducted to gauge the perception of people toward various environmental issues in the Capital has revealed that over 92 per cent of city dwellers feel the condition of the Yamuna is indeed “poor”. Reacting to the capital’s alarmingly high air pollution levels, the Delhi government is getting ready to launch an anti-pollution drive in the next two months. Prime Minister Narendra Modi will inaugurate a tree plantation campaign by planting a sapling at his official residence 7, Race Course Road on World Environment Day, officials said. Dr B Sengupta, an environmental scientist and former member secretary of the Central Pollution Control Board on Wednesday enumerated factors that cause pollution in the air and suggested measures to reduce the toxic elements in the air for enabling fresh and cleaner environment in Delhi/NCR. CR Park resident Prasanto K Roy may look like a common man but this 48-year-old media consultant is the owner of the Capital’s first green home, which he proudly calls Green One. In a bid to curb pollution in Yamuna, the Delhi Development Authority has decided to develop a wetland on the floodplains to treat the water of Barapullah drain before it is released into the river. Now extinct, the native plant and grass species that gradually disappeared from Kamla Nehru Ridge, part of Delhi Ridge, might be restored before monsoon. Close to a hundred waste-pickers met chief minister Arvind Kejriwal on Thursday to demand that they be involved in solid waste management by giving them access to door-to-door waste collection. The Delhi Government will equip 40 households in Saraswati Vihar in north-west Delhi with compost machines. Hardening its stance against open burning of trash, the Delhi government has decided to empower officials of its revenue department to crack the whip on the offenders months after a similar move arming the SDMs with the same powers to check growing pollution. Reinforcing its commitment to green initiatives such as introducing bio-fuel and solar energy in train operation, railways will observe World Environment Day on Friday to explore its future course of action to prevent pollution. The Indo-Tibetan Border Police force today decided to undertake an ambitious project of planting 10 lakh saplings across the country as part of its social initiative towards environment conservation. With an aim to increase green cover, the environment ministry has decided to create “Urban Forests” by utilising forest land lying vacant or degraded in various cities across the country. Union Environment Minister Prakash Javadekar exhorted industries and society to adopt the 3Rs of ‘Reduce, Reuse and Recycle’ on World Environment Day on Friday and urged all to opt for less in order to check the rate of depletion of natural resources. Delhi does not walk the talk when it comes to following the UN message on this World Environment Day-“Consume with Care”. Environment should be top priority of any government and it should be ensured that there is no “irreversible” damage due to development, National Green Tribunal Chairperson Justice Swatanter Kumar said today. River Ganga will show first signs of being pollution-free by October next year and the first project on inter-linking of rivers (Ken-Betwa) will take off within a year, Water Resources Minister Uma Bharti said here on Thursday. The new BJP regime in Haryana has endorsed the previous Hooda government’s move to whittle down the crucial buffer zone meant to protect the sacred Mangarbani forest in Aravalis and has even moved to get the proposal cleared at the NCR Planning Board, which meets next week. Environment Ministry is soon going to start a programme under which children will set up nurseries in urban city schools. Union Minister Uma Bharti on Thursday said the government has formed three vigilance committees to probe the spending on the various cleanliness drives launched for the Ganga and Yamuna rivers over the past 29 years. HUDA has asked the senior town planner to initiate action against 10 builders, including mall owners, housing societies and commercial complexes, for discharging untreated toxic sewage into drains reaching the Yamuna.